The body of 21-year-old British student Catherine Z. was found by a railway embankment in Krakow on 30 July. She had been beaten unconscious with a metal bar and left to drown in a drainage ditch. I’m calling her ‘Catherine Z.’ since Polish law prevents me from publishing her full name, but I know what her name is because she wrote to me just a few days before she died. Catherine Z. was studying History and Philosophy of Art at the University of Kent. She had dual Polish and British citizenship and was in Krakow working on building a career as a journalist. That’s why she wrote to me. She had put together a review of an exhibition at the Zderzak Gallery and wanted to know if I would publish it in the Krakow Post. I didn’t publish it, simply because she happened to send it on the day the July edition was finished and on its way to the printer. She might have written something more but, by the time the next edition was out, Catherine Z. was dead. My only contact with Catherine Z. was a few lines of email exchange, but I was still deeply shocked when I made the connection between the news reports and the name in my inbox – I cannot begin to imagine what the impact must have been on her family and friends. I did not know Catherine Z., but I do know that she wanted to have her review published. I’m grateful for the opportunity to be able to do this one tiny thing for someone whose life was cut so absurdly short. Time flies, time stands still – we have all the time in the world. What is time? An exploration of the paradox of time is the theme of the art work Loh-Koh-Moh-Tor and the exhibition centred around it. This is Ziemowit Kmieć’s first solo exhibition and has spurred much interest from the public and critics. Viewing the exhibition makes one feel like a time traveller. Each object is the result of observations on the nature of time and coming to terms with its merciless passing. A key work in this exhibition is the Timer – a large clock, showcased on a magenta wall, half covered by plaster. 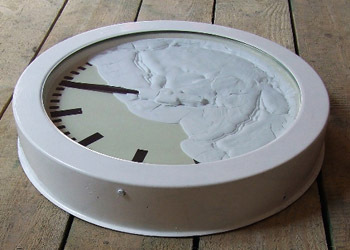 It’s reminds one of Salvador Dali’s clocks melting in the desert, an allusion that time is not what it seems. However, the exhibition is not surrealist, it is more orientated towards sensuality, poetry and lyricism. There is an element of melancholy and nostalgia in all this. The viewer must come to terms with time’s truth – that it is endless but, for us, limited. These themes culminate in the main work. Entitled ‘Loh-Koh-Moh-Tor’ it is a mixed media collage consisting of two inexplicably linked scenes. It consists of oil and pencil on canvas, mounted on wood and elements of collage. The format is a little like a polyptych, featuring a main scene and smaller predellas, which brings to mind the paradoxical sobriety and sensuality of 16th century religious painting. This work is not religious, but it reflects a shift in Western mentality. Once, art was about devotion and moral teaching, now it can focus on the bigger picture, leading us to a contemplation of the nature of time. The main scene consists of motion – a line forming a wave that curves around circular figures from left to right, under which is written: “Loh-Koh-Moh-Tor, the beginning of an exploration into time and motion.” In the left hand top corner there is a rectangular geometrical element. On the right hand side, or at the other end of the wave, there is a lyrical element a horizontal piece of text that reads: “The flowers are growing out from the body.” It suggests nature and our connection to it. This theme is continued in the lower half of the canvas, on the left, where we see a woman holding a branch that echoes the wave line. The colouring is similar to that of an old photograph, yellowed by the passing of time. The woman is shown frontally but we only see her torso, breasts and part of her neck, she cannot return our gaze, creating a psychological distance. The artist uses the curving branch to lead the eye towards the next scene – a woman’s head turned away from the viewer, hair pinned back to reveal a green circle and triangle that relate to acupuncture and shiatsu points. They suggest touch and the sensuality associated with it, in a visceral sense. The next panel is split into two parts – one part legs, one part feet. Calves, to be more precise, featuring the same acupuncture marks. This fragmentation of the body relates to the image as a whole. It reflects the strangeness of time, consisting of random moment that we can never repeat. The final scene is split into three parts, showing different visualisations of the ear. This chromatic exploration of random body parts is perhaps a metaphor saying human beings are only random parts in the enormous mechanism that is time. Viewing Kmieć’s work is like a walk through a quiet field on a summer day, where the mind is free to roam and wander, offering intellectual observations on the state of the world. Much of today’s art is so obsessed with popularity and money it often forgets why it has been created. Kmieć offers more. Think of a haiku, short and sweet and ruined by repetition, poetical and lyrical. This is Kmieć in a nutshell. Intuition, memory, energy, motion and sensuality combine to create an unforgettable experience that can never be repeated – that is the curse of time.